- 2 mm laser cut stainless steel and 4 mm plexi cover. The MagStik Plus are excellent. They can shift between 4 and 8 ways from the top of the control panel. 19" and even 22" HD widescreen has been used by others, the latter requires more width though. This is a lot of sound in a tight area. 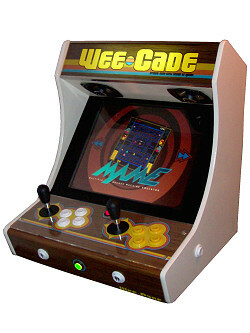 The WeeCade plays louder than most Ghetto Blasters. This makes it a fine jukebox. This was some of the least expensive components I could find, and it is still a very fast system for MAME and other emulators. I use a onboard gfx (GMA950). It also has a very low power usage and it doesn't produce much heat. I am very happy with the Maximus Arcade front-end. It is easy for noobs to configure and has very advanced features too. Looks absolutely stunning. If you decide to make your own MAME cabinet using my drawings, please feel free to make a donation, as I'm trying to raise enough money to make a new up-right cabinet, that's hard to do as a student.